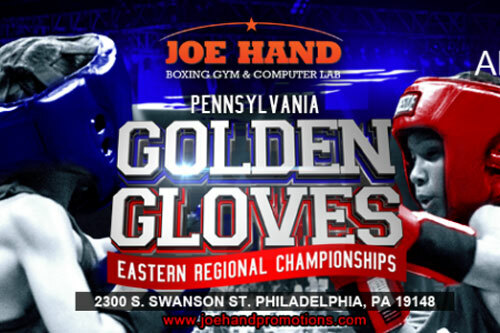 On April 6, 2019, the Golden Gloves Eastern Regional Championships were conducted at Philadelphia’s most active boxing venue, the 2300 Arena. It was the culmination of a month-long tournament of events at four locations, and pitted winners of the Philadelphia tournament against those from Central Pennsylvania. One of the bulwarks of Philly boxing since the Joe Frazier days, Joe Hand - actually two of them, Sr. and Jr. - hosted the Gloves for the 23rd consecutive year. Without these tournaments, where would professional boxing be? Yet amateurs yield little or no money, and are largely shunned by promoters big and small. Joe Hand Boxing Gym and Promotions are among the few who step up, and do so year after year. Additionally, the tournament was heavily supported by local unions, including the IBEW, FOP, Steamfitters, Painters, Cement Masons & Plasterers, Firefighters & Paramedics, Iron Workers, Sheet Metal Workers, Carpenters, Plumbers, Operating Engineers, and Laborers, plus the Irish Society. Famed local pros Bernard Hopkins, Jerome Conquest, Anthony Boyle, Jaron Ennis and Bobby High showed up to help support the young boxers. Lola Cariello was the regional director for the Golden Gloves. Nino Del Buono did the honors as ring announcer. Twelve championship bouts were contested. Earl Veney of Bozy’s Gym, Phila., won the Open 201 crown beating Jesse Oltmanns, son of the former pro boxer of the same name, of MMA Signature Gym in Stroudsburg. In a hard-punching battle, Veney showed the better pair of hands, putting punches together and rattling Oltmanns with a big left-right late in the second, for a 4-1 verdict. Francis Oran, Lehigh Valley BC, Allentown, looked good with a commanding 5-0 win over tough Tarig Green, Happy Hollow, Phila., for the 178 Open crown. The two battled it out in the first, but the much taller Oran controlled the final two. Frankie Lynn, unattached, took the 165 Open title 5-0 with a constant, swarming attack over Savon Wiggins, Cameron St., Harrisburg, in a withering battle. Quadir Albright, Bozy’s, stopped game Adrian Diaz, Hazleton BC, in the 2nd round for the 141 Open crown. In a bristling contest where every punch was thrown with mean intentions, Albright’s long reach and flying fists outgunned Diaz straight up. After two standing eights, referee Robert Rubnitz called a halt. Popular Ryan Sheeran, Grays Ferry Gym, Phila., edged Fernando Arroyo, Indio’s BC, Bethlehem, 3-2, with strength and aggressiveness in a rugged mauler for the 165 Novice title. In a contest dominated more by misses, lefty Daetwon Young, Stick ‘n’ Move Gym, York, gained a 5-0 win over Christopher Norris, James Shuler Gym, Phila., for the 152 novice title. In a crackling good slugger vs. boxer contest at 141 Novice, Jeffrey Marshall, Jinji BC, Lancaster, squeaked out a 3-2 win over Jose Rivera, Front St Gym, Phila. The bigger Rivera applied pressure and landed some solid blows, but the slick southpaw Marshall got angles for counter punches that caught the eyes of the judges in a good contest. In an excellent contest and mix of styles, Juan Marrero, Front St., took the 132 Novice crown over Frankie Padilla, Jinji BC, 5-0. Marrero circled and peppered Padilla with quick hands for the first two rounds before he slowed and the flat-footed, determined Padilla had a strong third. The 201+ Sub Novice crown was contested between Kevin Palmer, Marian Anderson BC, Phila., and gigantic Michael Bamiro, MMA Signature. The game Palmer was just outgunned and outsized, taking a standing eight. But by the third, the southpaw Bamiro was gassed and backing away. Bamiro won, 5-0. At 201 Sub Novice, Cory Dandy, Cameron St., stopped Stanley Rochester, Bomb Squad (parts unknown), in the second. The rangy Dandy dished out punishment in a bruising contest until Rochester appeared to have had enough and referee Danny Davis stopped it. In a good contest, Dominique Greene, Harrowgate Gym, Phila., took a 5-0 from Jeremiah Holland, Finefrock & Stumpf, Lancaster, at 141 Sub novice. The two boxed at long range in a close encounter but a lash-back right buckled Holland’s knees and nearly dropped him in the third. Robert Hoskins, Rock Ministries, Phila., opened the show stopping William Mastellar, Rocky’s BC, Berwick, in the 2nd round at 165 Sub Novice. Mastellar was getting the worst of the wild action while appearing to have trouble with headgear, until he missed with a wild right and went to the canvas, unable to continue. Walkover crowns went to Quaheem Davis, Kinsgsessing Rec, Phila., at 152 Open; D’Andre Hudson, Shuler, at 132 Open; Alberto Garcia, Marian Anderson, at 201+ Novice; Sanjay Davis, unattached, at 201 Novice; Antonio Biggio, unattached, 152 Sub novice. Quadir Albright was awarded Outstanding Boxer. The team proceeds to Pittsburgh for the Pennsylvania State Championships vs. Allegheny Association winners this coming Saturday, and the on to the National tournament in Chattanooga, May 4-12.